The 2009 Harley Davidson Fat Bob for Sale has upgrades including a Stage 1 Kit, Screaming Eagle intake with Vance Hines Big Radius exhaust Pipes. The motorcycle looks close to new and performs and rides perfectly. I believe this FatBob will sell fast so if you want it, hurry. The Fat Bob has low mileage of only 4,034 Miles. The massive stature of this motorcycle, led by twin headlights braced between polished triple clamps, has an unmistakable and remarkable street presence. The big tires with an aggressive tread pattern mounted on 16-inch Slotted Cast Aluminum wheels offer both a cool and confident ride. New features in the Harley for Sale include high performance chrome-covered coil-over rear shocks, and silver-faced speedometer with range countdown. The bike has chrome Tommy Gun 2-1-2 exhaust accents the black-and-polished Twin Cam 96 engine, forward foot controls and flat drag bars. 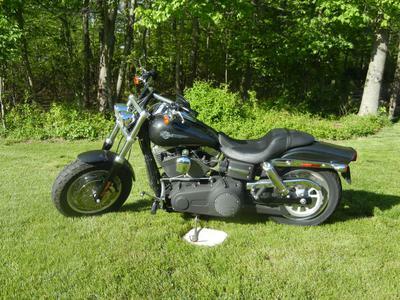 The 2009 Harley Davidson Fat Bob for Sale is located in Abingdon, MD Maryland, United States and if you're interested shoot me an e-mail using the comments form located below this classified and please mention that you found my ad on GoGoCycles Motorcycles for Sale in your message!